The item in question is the new condition AmazonBasics Extending Stick with Remote Housing for GoPro going for the very specific price of $4.39. You can buy up to three at the sale price. It averages 3.7 out of 5 based on 210+ customer reviews and it has over 50 answered questions. This, like the previously mentioned camera backpack are not lightning deals, so the sale and the price can change at any time. Since the bag is $26~, buying a bag gets you over $25, letting you buy up to three of these at the sale price. Bag the bags! 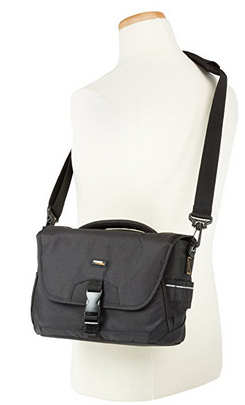 If you like orange camera bag interiors, the new condition AmazonBasics Medium DSLR Gadget Bag (Orange interior) is on sale at the moment for the very specific price of $12.30 with up to three per customer at the same price. Amazon itself is the only one “allowed” to sell AmazonBasics products at Amazon. We have a classic “falling knife” price! 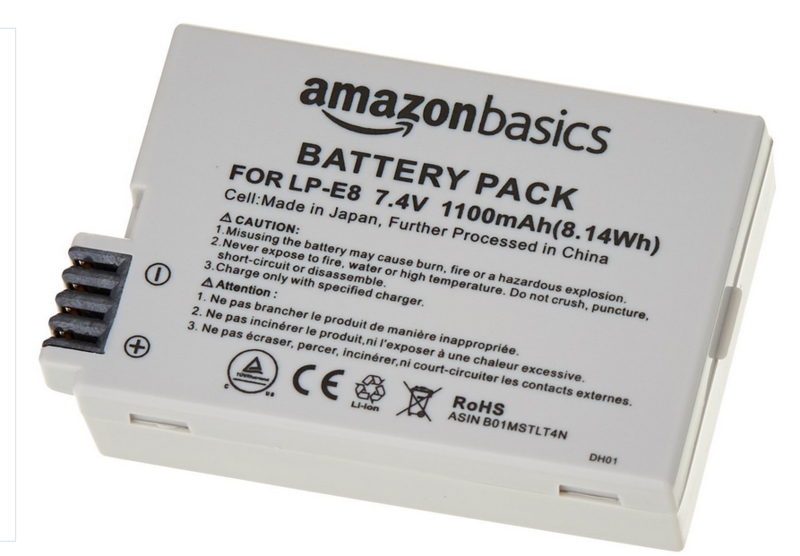 The new condition AmazonBasics Li-Ion replacement Battery for Nikon EN-EL5 is now down to $4 at Amazon by Amazon itself with a maximum of five per customer. This is however an Add-On item, so an order of $25+ is needed! We have a product recall alert! Amazon is recalling over a quarter million AmazonBasics PowerBanks because of a fire risk. The recall says that consumers should stop using them and return them for a FULL REFUND! The specific models affected by this are: B00LRK8EVO, B00LRK8HJ8, B00LRK8I7O, B00LRK8IV0, B00LRK8JDC, and B00ZQ4JQAA. Search for these in your orders or email confirmations of orders if you are not certain if you purchased them or not. You name it, AmazonBasics likely has it these days and that’s just one of Amazon’s many and multiplying house brands. Which brings us to the blue, very blue, AmazonBasics Hiker Camera & Laptop Backpack on sale for the very specific price of $49.32 with free shipping with up to three per customer at the sale price. The very orange goes for $56~. This is not a lightning deal so expiration time unknown. They average 3.9 out of 5 based on 63 customer reviews. Lots of four figure cameras were mentioned in our full frame spree, so now let’s balance things out with a single figures deal! The new condition AmazonBasics Extending Stick with Remote Housing for GoPro is down to $6.35 with up to three per customer at the sale price. It is however an Add-ON item, so you must needs place a $25+ order of eligible products shipped/fulfilled by Amazon, otherwise the shopping cart won’t let you buy it. The 100W equivalent LED light bulbs of the A21 kind are not easy to find or as cheap or subsidized like the 40W and 60W equivalent. If you happen to need them in multiples of 16, and you don’t need to receive them immediately, the AmazonBasics 16-packs are down to $45.29 in the Daylight (5000 Kelvin) and for $46.53 in the Soft White (2700 Kelvin). This puts each light bulb under $3. If you don’t need that many or need them right away, the 6-packs are in-stock and ready to ship for $22~ in either Daylight or Soft White, making them $3.67 per light bulb. With their AmazonBasics line, Amazon can discount them and adjust their prices as they see fit, they don’t have to play the whole MAP song and dance. Perhaps this is one of the many reasons more online retailers are having more products under their own house brands. Which brings us to the new condition AmazonBasics Carbon Fiber Monopod on sale for the very specific price of $53.26 with free shipping with up to five per customer. Could also be useful if you want to cosplay Gandalf 🙂 This is not a lightning deal, so expiration time unknown. On the single figure accessories front, the new condition AmazonBasics Extending Stick with Remote Housing for GoPro is on sale for the very specific price of $7.83 by Amazon itself, with up to three per customer at the sale price. This is not a lightning deal, so expiration time unknown. It averages 3.8 out of 5 based on 170+ customer reviews. It is an Add-ON item, so you must place a $25+ order, otherwise their shopping cart won’t let you buy it. Note that all kinds of options are available on the same listing, so if you are checking them out, make sure you are still looking at the intended option. One of the first AmazonBasics branded “blockbuster” products for Amazon is this AmazonBasics DSLR Backpack and it is currently on sale for the very specific price of $22.37 with up to five units per customer. The usual free shipping terms apply. It’s not a price-match since they are the only ones offering it. Unless they are price-matching Amazon from The Mirror Universe. On the budget side of Lighting, we have light bulbs! The 100W-Equivalent 6-pack of A21 AmazonBasics LED light bulbs are back in-stock at Amazon in the Daylight (5000 Kelvin) for $20 and in the Soft White (2700 Kelvin) also for $20. Free shipping for Prime members or with a $25+ order. If you need that extra $5 push to get to $25, check the “Other Sales at Amazon” segment further down the Lightning Deals round-ups. If you need a handful of AAA rechargeable batteries, the 12pk of AmazonBasics 800 mAh batteries is currently on sale for $12 at Amazon by Amazon itself. That’s $1 per battery. You can buy as many as you like. This is an old fashioned sale, not a lightning deal, not an Add-On. More camera bags action, the new condition AmazonBasics Medium DSLR Gadget Bag (Orange interior) is on sale for $13 with a limit of up to three bags per customer. Free 2-day shipping for Prime members even if you get one and nothing more. Non-Prime members have the usual $25+ minimum (eg two of these). Continuing on sale is the Case Logic DCB-304 Compact System/Hybrid Camera Case for $7 with a limit up to five per customer. This is an Add-On item, so you need a $25+ order to buy it regardless of Prime membership status. If you are close to $25, check the previous AmazonBasics posts. The AmazonBasics Cleaning Kit hasn’t been discounted to doorbuster pricing again, but we have another AmazonBasics camera bag that is currently discounted. It is the new condition AmazonBasics Holster Camera Case going for the very specific price of $6.94, with up to three per customer at the sale price. Check reviews (4.3 out of 5 on 880+) and answered questions (91 of them) and the product description and galleries to get a feel for what it can and what it cannot fit. Orange is the new discount! For Prime members only, Amazon is offering the orange-interior version of their AmazonBasics Medium DSLR Gadget Bag for $15 with free shipping (since only Prime members can buy it) and a maximum of five bags per customer. There are two sizes on the page, so page attention to that if you are reading reviews and answered questions. All together, they average 4.6 out of 5 based on 3000+ customer reviews, and have nearly 300 answered questions. Check the pictures and descriptions for measurements to get a feel for what you can fit in. Here’s a screenshot of one of the many gallery pictures over there. The 80-second video is a general AmazonBasics branding video, not for this bag in particular. If you are a fan of the AmazonBasics brand and need 3rd-party Canon LP-E8 batteries, Amazon is offering their AmazonBasics Li-Ion Battery for Canon Cameras (LP-E8) for $14. Limit up to five units per customer. Free shipping for Prime members or with a $25+ order (eg two of these). There is only one customer review so far, posted last week. For more options, check our previous AmazonBasics round-up including the $23 Flash, along with a Backpack for 17″ laptops for $30 that is not in the round-up. It’s back on sale again! The new condition AmazonBasics Electronic Flash is down to $23.26 with free shipping for Prime members or with a $25+ order. Limit up to five flashes per customer at this sale price. This is not a lightning deal. The good old Camera Cleaning Kit eventually sold out a few days ago. When it came back in-stock, the price was/is $9. This is turning into the small AmazonBasics camera bag of a few months ago that kept getting discounting. The new condition AmazonBasics Cleaning Kit for DSLR Cameras and Sensitive Electronics is now down to $1.94 with a limit of three sets per customer. On the budget side of lighting, the new condition 6-pack AmazonBasics 100W Equivalent A21 LED Light Bulbs is on sale for $19.24 and shipping in 1-2 days. This is the Soft White (2700 Kelvin). Meanwhile the Daylight (5000 Kelvin) 6-pack goes for $20 but the shipping estimate is “2-5 weeks”. You can buy as many as you want. PS: if you are close to free shipping, check the previous AmazonBasics posts for ideas. The craziness of Amazon pricing! The AmazonBasics Cleaning Kit for DSLR Cameras is now down to $2.23 per set. However, the limit is now three sets per customer. It was up to ten sets per customer when the price was hovering around $3. This is still an ADD-ON item (you must needs place a $25+ order, elsewise the shopping cart won’t let you buy it – look for ideas to get to $25+ in the AmazonBasics posts. You get six different cleaning accessories in each set, outlined here [the numbers in the picture below are indexed in the aforelinked post]. If you are looking for AAA rechargeable batteries, the 8-pack AmazonBasics AAA Rechargeable Batteries (made in Japan) are on sale for $10 at Amazon by Amazon itself with a limit of 30 8-packs per customer. If you prefer AA batteries, the AA 8-pack goes for $14 each. … which brings us to the AmazonBasics Cleaning Kit for DSLR Cameras currently going for just under $3. 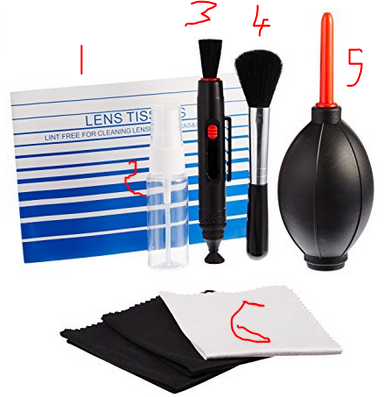 Each set has six different products – see detailed post. One of this will get you over $25, and get you free shipping. If you always run out of cleaning supplies, or you want to have a full set in every bag, car and location, Amazon has a sale on their AmazonBasics Cleaning Kit for DSLR Cameras for the very specific price of $3.27. You can buy up to ten sets per customer. This set averages 3.9 out of 5 based on 30 customer reviews. This is however an ADD-ON ITEM, so you must needs place a $25+ order, otherwise the Amazon shopping cart will not let you buy it. You can get to $25+ with any combination of eligible products, a mix of Add-ON and not, or ADD-ON only, eg eight of these will get you to $25+. For other low-priced Add-ON items to help you get over $25, check the $5 Gadget posts. Another way to jump over $25 is to get the $28 AmazonBasics Flash. This is its regular price, not a sale price. It averages 3.9 out of 5 based on 88 customer reviews and it is currently the #1 seller in Shoe-Mounted Flashes. PS: keep in mind, Amazon’s best selling lists are only as good as their categorization of products. The more products they add and the more 3rd-party sellers are allowed to create listings, the bigger the mess it becomes. This is one of the reasons I stopped doing the Best Seller Charts blogs since more and more cameras were missing and more miscategorized products were included. The AmazonBasics Amazon house brand has quietly amassed over 120 camera and photo products, some of which randomly (?) go on a recurring sale, such as the new condition 50-Inch AmazonBasics Lightweight Tripod with Bag on sale for $13~ with a limit of up to ten units per customer. Free 2-day shipping for Prime members, or with a $25+ order (eg two of these). It is on the same listing as the 60-inch version. Together they average 4.4 out of 5 with over 7000 customer reviews. There is no way to get review average sub-scores for each model ~ short of counting and averaging them manually!